President-elect Barack Obama calls good intelligence "a necessity"
Obama paints dire picture of the economy, urges "dramatic action"
(CNN) -- President-elect Barack Obama on Friday announced Leon Panetta as his pick for CIA director and retired Adm. Dennis Blair for director of national intelligence. Leon Panetta's selection as CIA director has provoked strong reactions in political and intelligence circles. "Today we face a world of unconventional challenges," Obama said at a news conference. "Good intelligence is not a luxury -- it is a necessity." Obama said Panetta and Blair are "public servants with unquestioned integrity, broad experience, strong management skills and the core pragmatism we need in dangerous times." Obama also named former CIA official John Brennan as White House homeland security adviser and deputy national security adviser for counterterrorism. Brennan will face the task of reviewing whether the Homeland Security Council, created after 9/11, should be folded into the National Security Council or remain a separate entity in the White House. Brennan will hold the title of assistant to the president, a sign that he will report directly to Obama. "The task for the team that I have assembled is to guide, support and integrate their efforts so that we protect our security and safeguard the values that all of us have pledged to uphold," he said. The selection of Panetta has provoked strong emotions in political and intelligence circles since it was reported earlier this week. Borger: An Obama team oops on CIA pick? Panetta has little hands-on experience in intelligence, but supporters describe him as a consummate manager and bipartisan Capitol Hill insider who gets things done without alienating people. Panetta, 70, has had a long political career, beginning in 1966 when he was a legislative assistant to U.S. Sen. Thomas H. Kuchel, R-California. He also was the chief of staff in the Clinton White House. 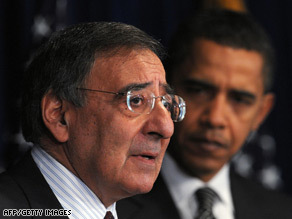 Supporters have said Panetta was a high-level consumer of intelligence during his time as chief of staff. Several former officials who served with him said he expressed interest and was involved in foreign policy and intelligence-related issues confronting the Clinton administration, although he was not as intimately involved as those directly responsible for national security policy. While the attention Friday was on Obama's intelligence team, the focus was on the economy for much of the week. On Thursday, the president-elect urged Congress to support his economic recovery plan, warning that failure to take "dramatic action" on the package as soon as possible would have devastating long-term consequences for the nation. Obama said his plan immediately will help jump-start the economy by doubling the production of alternative energy within three years, improving the efficiency of federal buildings and homes, computerizing medical records, equipping schools with 21st-century classrooms, expanding broadband across the country and investing in science and new technologies. The president-elect said the cost of his plan would be "considerable" and would "certainly add to the budget deficit in the short term." He did not put a price tag on the stimulus package, but observers have estimated it would cost about $800 billion. Speaker Nancy Pelosi said Thursday that House committees will begin action on the economic recovery package in the next couple of weeks, with a vote in the full House slated for the week after the inauguration. But if that schedule slips, Pelosi pledged to cancel the House's planned weeklong break in mid-February. Meanwhile, Obama's Cabinet confirmation hearings began Thursday. First up was former Senate Majority leader, Tom Daschle -- the Department of Health and Human Services nominee who warned of corrosive flaws in the health care system. Daschle was introduced by another former Senate leader, Republican Bob Dole, who praised Daschle's integrity and fairness. The Senate is expected to confirm the majority of Obama's Cabinet appointments easily, including Daschle, but Attorney General-designate Eric Holder could face a grueling round of questions from Senate Republicans. Holder has drawn heavy criticism from Republicans over his involvement in former President Clinton's last-minute pardon of Mark Rich, a major Democratic donor and billionaire financier charged with federal tax evasion. Senate Democrats have long braced for a tough committee hearing over Holder, especially after Republicans successfully delayed its start to obtain more time to review his lengthy record in both the public and private sector. His confirmation hearing is scheduled for Thursday. CNN's Ed Henry and Kevin Bohn contributed to this report.